Director – Mike Mitchell, Screenplay – Phil Lord & Christopher Miller, Story – Matthew Fogel, Phil Lord & Christopher Miller, Producers – Jinko Gotoh, Dan Lin, Phil Lord, Roy Lee & Christopher Miller, Music – Mark Mothersbaugh, Songs – Jon Lajoie, Animation Director – Trisha Gum, Animation Supervisor – David Burgess, Animation – Animal Logic, Production Design – Patrick Mark Hanenberger. Production Company – Warner Brothers/Lego Systems A-S/Rideback/Lord-Miller/Vertigo Entertainment. The Lego world has been destroyed by the arrival of the Duplo aliens. Emmet’s offer of a brick heart in friendship precipitated an attack and the entire city of Bricksburg has been demolished. Five years later, the survivors live in the ruins that have been renamed Apocalypseburg. Everything is grim and Lucy criticises Emmet for maintaining an attitude of positivity in the midst and encourages him to grow up. An alien envoy General Mayhem arrives and invites the leader to a wedding ceremony on the Systar planet. When they cannot decide who is leader, she snatches Lucy, Batman, Unikitty, Benny and Metalbeard. They travel to the Systar Planet where the Queen Wateva Wa’Nabi announces she is going to marry Batman. The others are swayed by music therapy and her offers to fulfil their dreams. Meanwhile, Emmet converts his house into a spaceship and sets out to rescue Lucy. He is saved along the journey by the adventurer Rex Dangervest, whose tough manner Emmet admires and realises he wants to emulate. Rex agrees to take Emmet to the Systar Planet, while giving him advice on how to grow up. There they set out to rescue Lucy and the others before the wedding takes place. The Lego Movie (2014) took the world by storm, proving a hit that earned nearly $500 million worldwide. 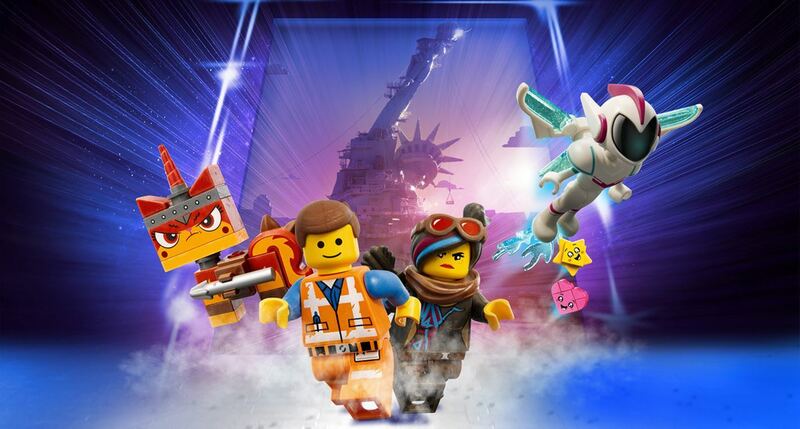 Both the novelty of seeing Lego toys come to life and a whole universe based on them had some appeal, although what people mostly tuned into was director/writers Phil Lord and Christopher Miller’s wittily irreverent mix-up of assorted media franchises and fourth-wall breaking gags. Although Lego animated films had been around for a time, The Lego Movie spawned a franchise. The film’s breakout character Batman was given his own film with The Lego Batman Movie (2017) and there was also The Lego Ninjago Movie (2017) before this sequel to the first film. Surprisingly it failed to be the same runaway hit that the first film was – it did earn a not immodest $100 million worldwide, nevertheless that was only a fifth of what the first film grossed. This second time around, Lord and Miller, also the directors of Cloudy With a Chance of Meatballs (2009) and 21 Jump Street (2012) and sequel, have dropped back to a writing and producing position. To my dismay, the actual directing duties have been handed over to Mike Mitchell. Like Lord and Miller, Mitchell has come from directing mainstream fare, mostly comedies like Deuce Bigalow, Male Gigolo (1999) and Surviving Christmas (2004) before coming to specialise in animation and/or family entertainment with Sky High (2005), Shrek Forever After (2010), Alvin and the Chipmunks: Chipwrecked (2011), Trolls (2016) and the live-action scenes for The Spongebob Movie: Out of Water (2015). In the majority of cases, Mitchell seems to prefer coming on board and directing either follow-ups to other films and/or material based on pre-established products. In all of these cases, he directs at such an insipid level or overruns everything with pop culture in-referencing that it causes the films to sink. Shrek Forever After was an indifferent autopilot directed effort that essentially killed the series, while Trolls earned a black star review from this site. The Lego Movie 2 engages in all the meta-fictional playfulness of the first film, although it should be noted that most of the crossovers are now to films held under the Warner Brothers copyright (and one or two from MGM). Dropped have been any of the Star Wars crossovers that are held by Disney. The film wryly spoofs and gets digs into assorted other films – in a parody of Resident Evil’s Alice, Lucy tries to teach Emmet the art of looking broodingly out across the post-holocaust landscape and giving an inner monologue, while the landscape features a half-demolished Statue of Liberty in its midst a la Planet of the Apes (1968); the vehicle chase spoofs Mad Max Fury Road (2015); there are cameos from Dorothy and companions from The Wizard of Oz (1939); while Rex’s construction of a time machine cannibalises from Lego representations of The Time Machine (1960), Doctor Who (1963-89, 2005- )’s Tardis, Skynet from The Terminator films, the phone box from Bill and Ted’s Excellent Adventure (1989) and even Hot Tub Time Machine (2010). The character of Rex voiced by Chris Pratt has a team of trained raptors and goes into action with his own mixtapes in a nod to Pratt’s characters in both Jurassic World (2015) and Guardians of the Galaxy (2014). We even get cameos from a Lego Bruce Willis and Ruth Baider Ginsberg simply because. There is a number of sly digs at Batman’s solo Lego adventure. With the Justice League (2017) film and the launch of the DCEU in the interval between the first film and this, the Justice League have more prominent characters here, most notably an introduction of the Jason Momoa-voiced Aquaman (voiced by Momoa himself), even a scene that contrast him to a more comic-book modelled Aquaman. Continuity purists might have issues with scenes where Batman gets swayed by matrimony but you cannot deny the cleverness of a song that manages to wind in references to the previous Batmans essayed by Christian Bale, Michael Keaton, Val Kilmer, George Clooney and Adam West. I had misgivings about Mike Mitchell but have to say the film emerges as a reasonable sequel to The Lego Movie. I can lay a good part of the success with Lord and Miller who return to perform scripting duties and guide the film as producers. The main problem with it is that the novelty of the gags and universe and its crossovers are not fresh this time (not mention have been milked by two other Lego films in the interim). However, Lord and Miller have determined to expand on the basic ideas of the original and further develop the fourth-wall breaking aspects – here much is wound into a metaphor of the characters being abducted to the ‘Systar Planet’ and being overrun/brainwashed by glitter, makeovers and music therapy including a ditty musical number called Catchy Song that consists of the line “This Song is Gonna Get Stuck in Your Head” repeated over. I am not entirely sure if I go along with the criticism of male childhood development the film makes that seems to polarise things along gender lines, saying boys are inherently aggressive and girls much more loving, cooperative and pacified with the villain of the show revealed to [PLOT SPOILERS] have been turned toxic and destructive as a result of being excluded from play. The film does make its points in some interesting ways. In fact, it might be said to be one of the few sequels that doesn’t simply repeat the points of its predecessor but expands upon them.